A sci-fi love story from the author of Ghost World in which a man, whose wife has been murdered, travels back through time to try and save her. Patience is stunning. Disturbing, convoluted, darkly comic and just plain dark, the book itself is a thing of beauty ... The book's self-awareness and sympathy make it more than just an exercise in the mixing of genres, but it's in this unabashed mixing that Clowes creates a story that is as transcendent as it is upsetting — and affirming. 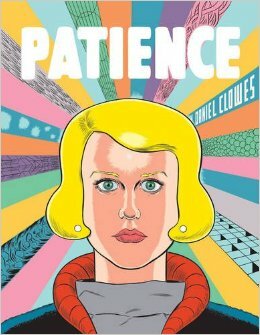 In Patience, a love story like many of Clowes’s novels, the incursion of sci-fi is at first delightfully surprising and thereafter modulated so effortlessly that you see behind the irony of that self-consciously purple-prose blurb to the truth it encapsulates ... This is a deeply affecting book, and despite its gritty prose, colorful language and hardboiled trappings, a tender one, its sustained undertow of tenderness and melancholy giving it a surprising delicacy. Patience, is not only among the best of his best, but also the work of his that is the most like nothing other—and nothing less—than a comic book ... coolly assured and utterly unpretentious ... Patience is a work of high comics so smart, so serious, and so finely wrought that I shouldn’t diminish it by saying it’s better than any novel without pictures I’ve read this year. What did you think of Patience?